An Ongoing Situation (I and II) and Experience; to Experience are projected image works that incorporate multiple forms of image and presentation. These works use analog slideshows and video simultaneously as a means of both reclaiming images of the past and correlating temporal language within memorial trace images. Each of these works places the viewer within a unique vantage point and light source where they must reconcile the optics of the photographic image with juxtaposed language. The first in the series, An Ongoing Situation I, is a linear video piece featuring 35mm slides that have been written upon by hand. 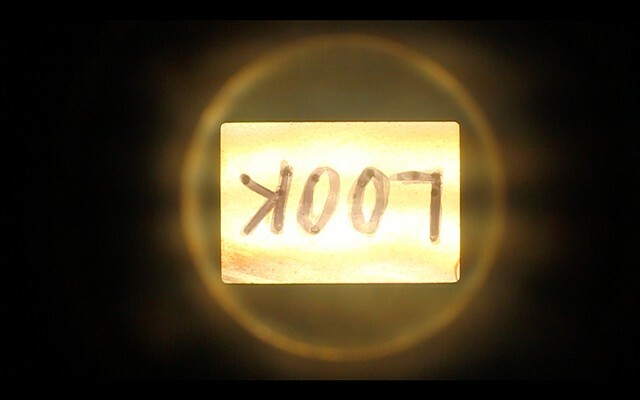 The slideshow is video recorded through the lens of the projector, the projectors bulb being the light source. The result is an image distorted by its own mechanism analogous to the distortion that time imposes upon memory and history. The sound of the machine and the rhythmic movements are recorded as well, collapsing the two different modes of image projection within a single work. The temporal language is repeated and punctuated by associated images. In every repetitive cycle, the presentation of the language changes, distorting the experience. By the end of the piece, the words only and lies remain on the screen for uncomfortably long periods of time. The words acquire a visual weight while also creating an affective space in which duration is associated with the intensity of each word’s connotation. 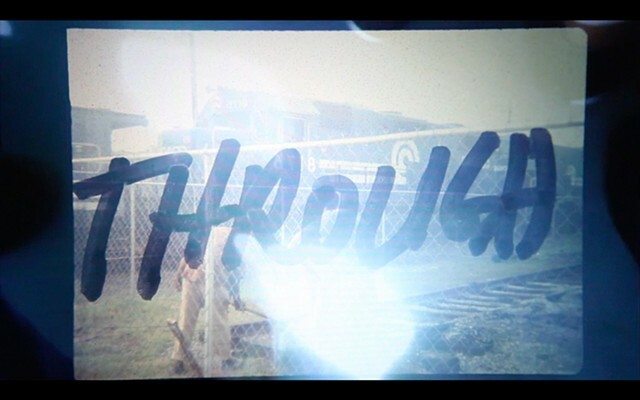 After a few seconds, the intensely lit handwritten words appear to break down into abstraction: inscribed marks and round pools of ink that bleed into the faded 35mm slides below. An Ongoing Situation II requires the viewer to enter an infinite loop contained within two channels of video, one that plays continuously, the other that comes in intermittently to generate responses and associations within the gallery space. The two-channel video is shown on rear projection screens, creating three distinct vantage points. In the videos, intense beams of light reference solar flares and eclipses. Here, one can get lost in a hidden time–between the memorial time of the images and the cosmological time of the implied solar events that punctuate the sequence. 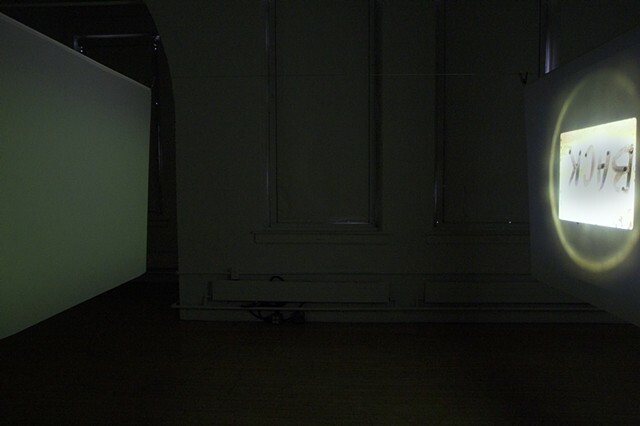 The viewer is also situated in this between-space; either bracketed by the two screens or sees them as receding into a simulated one-point perspective. One can never experience all of the information– language or image–in its ‘proper’ orientation. 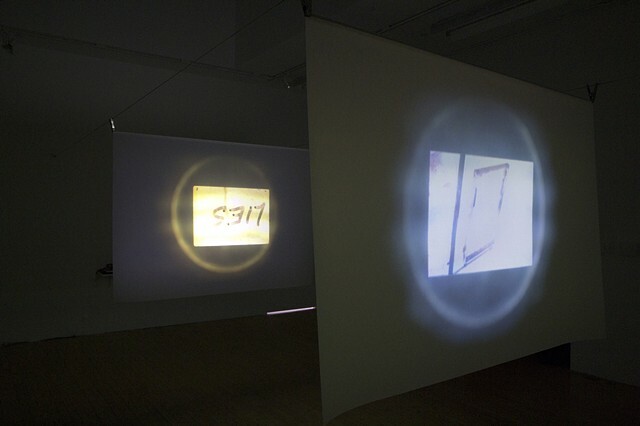 Due to the reversal of the projection based on the location of the viewer, it becomes impossible to assign a single proper orientation; so one gets lost in the optics of the upside-down, backward images and handwritten text. Image and text together insistently mimic the process of photography as well as projection; in both cases the lens perpetually reorients things for the eye. The surface (or destination) of the projection is then made the same as the lens by which the image is made and viewed. Experience; to Experience takes a different approach as the writing upon the images functions as redactions and is played in its standard orientation and format, a 35mm slideshow. The images are then forced to share a screen with a video projection. In this work, the artist operates the equipment in person, controlling each slide’s duration. The handwritten text is a prosaic writing that relies on shifters–words that change meaning based on context–to create an illusion of neutralized subjectivity. This locates the language in a space somewhere between textbook and memoir, but just beyond the grasp of categorization due to the amorphous signifiers. Between each line of the text there are gaps where the slide carousel is empty; therefore, there is no image present, only the loud, rhythmic sound of clicking through the slide projector. The piece is choreographed over a twelve-minute period and features a building soundtrack of temporal, reverberating noise. This results in an experience of the space between lines. The absence of reading, relative to both the image and the handwritten text upon it, alludes to silence despite the omnipresent noise in the room. This body of work explores concepts of memory, as it relates to dated technology and planned obsolescence. The constantly out-of-focus, distanced, and disorienting images and language are analogous to the way that recent histories, both personal and political are and have been, written. These works dig into the temporal scale, then the day-to-day, accessing generational experience and the constantly reinterpreted past, yet they remain in a recognizable space.